"THE CUSTOMER IS ALWAYS RIGHT" HA! This is a hard review for me to write as 4 days later I still have residual puzzlement at what took place. I was first attracted to the restaurant after reading an article in the New Times paper. The name itself was a big drawer as I love a play on words and snappy phrases. The second big selling item was all the raves about the cookie dough cones which many reviews on yelp talked about so add that to a new restaurant and Allen liking Mac & Cheese off we went. It is easy to miss when entering the shopping center from the east as they only have their name facing west though many well known 'fats causal' restaurants are across the way from including BurgerFi which had a long line the whole time we were in I Heart Mac & Cheese which was basically empty.. It started off good with a hearty greeting as soon as we entered from Anika the order taker and cashier. At first it was a little confusing as menus weren't available up front though it was on the wall above where you ordered and there were 'take out' menus available there. It was partially my fault but I thought after ordering Basic Mac & Cheese ($3.95), since it didn't say anything about what kind of cheese I thought you ordered the cheese you wanted on the macaroni which cost a dollar. I then ordered the Cookie Dough cone to be told they don't have them anymore! What seemed as a major selling item on the menu was going to be replaced by what sounded like regular desserts. I wasn't happy about that but okay. Then I ordered a fountain diet coke but seems the machine wasn't working. When we got to the table I looked at my receipt and saw that it was $4.95 which made me go up and ask Anika if it was a mistake and she was handling it very well until someone behind the counter--Owner? Manager? Cook? I really don't know as he never introduced himself. All of a sudden I was hearing that this was the first restaurant of its kind, that the planned to open 10 more soon, that he doesn't go home and yell at his wife and kids (!) and that it was a new place and they were having growing pains. Then, after hearing his rant, I was a little thrown and--OMG!! I made a mistake!--I mentioned about that a big selling item to me was their ice cream dough cone! Next thing I know I was angrily being told they don't have ice cream! Okay maybe the guy was having a bad day and instead of yelling at his wife and kids he thought it would be better yelling at me! I was a professional waiter for 38 years and the first thing I was taught by Sam & Dorothy Piccolo's (where I started in Miami Beach)) was 'the customer is always right' is not always the case but even when they are wrong you immediately respond with "I'm sorry" (and try to say it at least twice) and then "What can I do to make it better?" 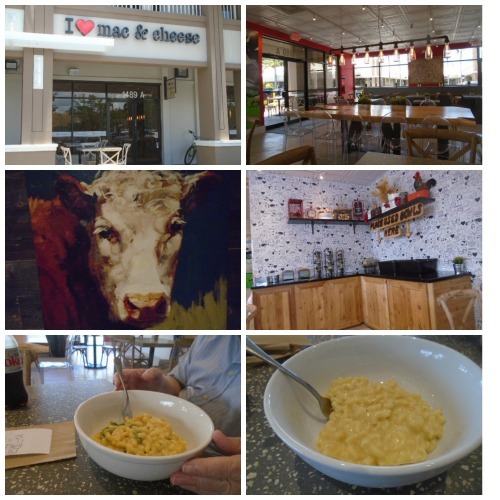 The concept of I Heart Mac & Cheese is a draw but when you walk in and are told they won't have this anymore and they don't have that plus get aggravation from someone involved with the business you go eat your meal, leave and never come back or recommend the place. There are close to 2,890 restaurants to choose from in the area and a business has to do more than just open their doors.